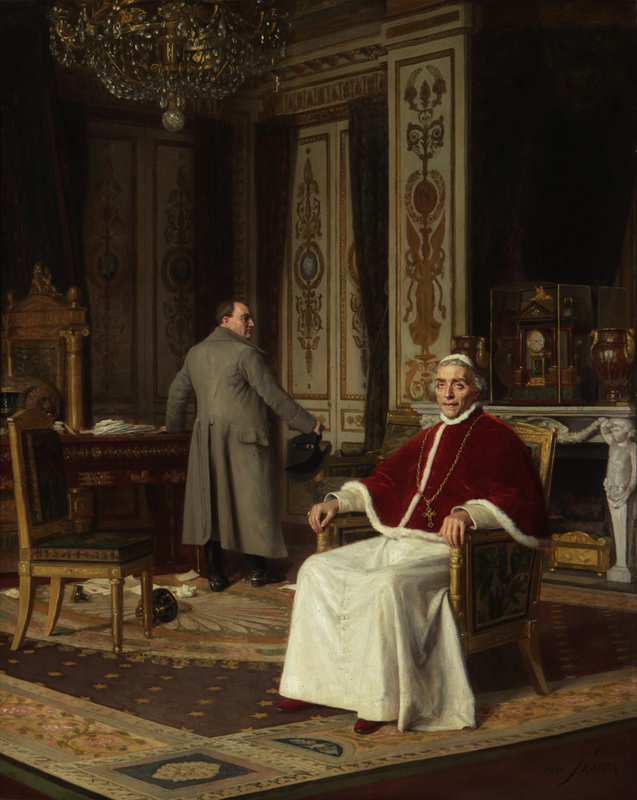 This scene by French artist José Frappa depicts a seated Pope Pius VII looking upwards with Napoleon standing in the background, leaving evidence of an argument scattered on the ground. Since the time of his election until the fall of Napoleon in 1815, Pope Pius VII was continually in conflict with the Emperor, arguing for the end of his exile and the return of the Papal States, which had been disbanded by the armies of the French Revolution. The young Frappa showed an interest—and talent—in the visual arts from the time he was quite young. Building on this interest, his parents apprenticed him as a designer in silk trade in Lyon. However, Frappa soon determined that his interest was primarily in the art of painting, rather than textile design. His parents were less than enthusiastic about this development, but eventually agreed that he should attend the Ecole des Beaux-Arts in Lyon. Frappa decided to pursue his passion for painting and moved to the big city of Paris to study at the national Ecole des Beaux-Arts. According to an 1890 source, Frappa studied first with Isadore Pils (1813-1875), and then with Charles Comte (1823-1895) and Jehan-Georges Vibert (1840-1902) after Pils’ death in 1875. [i] Both Comte and Vibert specialized in anecdotal genre paintings, which were very popular during the early years of the Third Republic. Frappa’s painting, The Flautist, which is dated 1875, reflects the influence of his professors in this genre. It not only demonstrates the young artist’s competence in drawing and composition, but also provides a glimpse of the type of subject that will come to characterize much of his work. The painting is clearly an image of a model posing as a flautist in a staged setting, which may even have been intended as a reference to Mozart’s opera, The Magic Flute. It is light-hearted and just intriguing enough to draw the viewer into imagining a narrative to fit the scene. Frappa will continue to refine this approach over the years as he explored a variety of anecdotal genre subjects ranging from scenes of monks and cardinals of the Catholic church to rococo-revival lovers’ trysts. When Frappa made his Salon debut in 1876, anecdotal genre painting was amply displayed and widely appreciated by the public. According to Emile Zola’s review of the Salon that year, viewers stood in line to see The Flower Market by Marie-François Firmin-Girard (1838-1921), a charming depiction of beautiful women among the flower sellers next to the Seine. More influential for Frappa, however, was The Cardinal’s Antechamber, a painting by Vibert, in which a red-robed cardinal addresses a lovely young woman seated in an opulent setting. Vibert was well known for this type of image, and undoubtedly mentored Frappa as he began to define his own artistic path. Four years later, he won an honorable mention at the 1880 Salon, no small achievement among a field of 7,289 entries, the largest number ever at the Paris Salon. Frappa’s prosperity depended in part on his ability to work in a variety of genres ranging from traditional portraiture and realistic narratives depicting serious subjects to the amusing anecdotal scenes of religious figures, particularly cardinals and monks engaged in all too human foibles of enjoying a glass of wine or playing popular card games. In 1897, Frappa was represented in the Exposition Internationale in Brussels with two paintings, Le dispensaire d’enfants (The Children’s Clinic) and La femme au manteau bleu (The Woman in the Blue Cloak) [iii] and was awarded the Legion of Honor medal on February 4, 1898, in large part because of his work on the exposition. Janet Whitmore, Ph.D and Rehs Galleries, Inc.
[iii] See Catalogue illustré de l’Exposition internationale de Bruxelles. Beaux-arts. (Paris: E. Bernard & Cie, 1897), 3, 41.